RheingoldRiver's League of Legends Blog: Lulu: Level Help, Pix! or Glitterlance? This article has now been updated after patch 1.6. First, we'll take a look at raw numbers. Leveling E over Q gives you an additional 5 damage to one target OR a shield of 45 instead of 45 damage, with +5 relative mana cost change. Leveling Q over E gives you .25 seconds superior slow and an additional 40 total damage if you hit two targets. So, which one should we level, and in what circumstances? Shield of 45 is actually more efficient than damage of 45 because a shield is true health, whereas the damage is magic damage---you'll actually do only 35 damage to them assuming no pen on you and no bonus MR on them (reasonable assumption because they'll probably have some MR and you'll probably have some MPen). Single-target damage of E is greater than single-target damage of Q, damaging second target doesn't matter that much unless you have lots of AoE damage (which you don't pre-6). Fight probably won't last 7 seconds, so you're unlikely to get a second Q despite its shorter cooldown. If you baited out a lot of damage on yourself early, you can still apply shield to your ADC without being close to their ADC; however you can't also Q unless you have enough mana for both spells. However, if your ADC can win without the help of your shield, superior CC will mean more. In teamfights, extra damage across 3+ members of their team is likely (early on, this damage can be very relevant). Extra CC duration will likely help (chasing them down, letting ADC kite, keeping them in AoE, etc.). Akali is probably the quintessential example of someone you'd rather have a shield on your ADC than help him kite against, and you likely will need to E her to reveal instead, but vs other high-mobility assassins, shield might be better. You get to have Q maxed earlier (as discussed above, E much less relevant after laning is over). Late game, levels in W could easily be more valuable than levels of E. How much damage can they output in .25 seconds? Their ADC can probably output more than 45 true damage in that time. So getting E early sacrifices levels of W later. Moving Pix to the correct location costs less mana. Will help you push lane if desired. These charts show Damage:Mana efficiencies of your E-Q combo depending on how many targets you hit. The color represents different possible ability splits between champion level 2 and 9 (it's assumed you only take one point in W, at either 3 or 4, and you take ult at 6). As you can see, if you are hitting at least one target per Q, you'll do better by leveling Q; the other columns show you how much better. 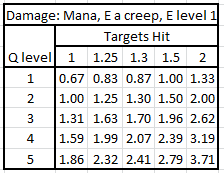 Finally, this chart shows you the mana efficiency of Eing a creep and then hitting the enemy champions with Q from the E'd creep. Your ability to do this is often an argument in favor of a Q-level because it massively increases your poke range. But how mana-efficient is it actually? The answer is that it scales up massively as you level your Q. So, which skill should you level? I usually like to get E at 2, 4, and 5, and then switch to Q after that. But if there's not much trading between the ADCs I'll go for a straight Q-max, and if I'm really scared of my ADC dying to burst that he can't kite I'll max E all the way. But the answer is that it really depends, and you should just be aware of reasons to level each one before deciding. Updated Guide  - Get Unlimited Free Riot Points for League of Legends!